This article will be continuously updated as the inquiry progresses. In 1996, I was approached by Joe Galliani and Mike Baggetta, dba The Parks Company (www.theparksco.com) to enter into a two year contractual agreement whereby I would allow them to sell my WPA poster reproductions through their printed catalog. During that two year period, I had completed enough prints to batch together a note card set and I contacted Sunset Magazine about this unique art. Sunset was very interested in an article--and put my reproductions in their Christmas Edition (December 1996)--in there "Gifts on the Go" section. I gave this business to Mike and Joe dba The Parks Company and they made approximately $65,000 in three weeks--manna from heaven (and Ranger Doug). 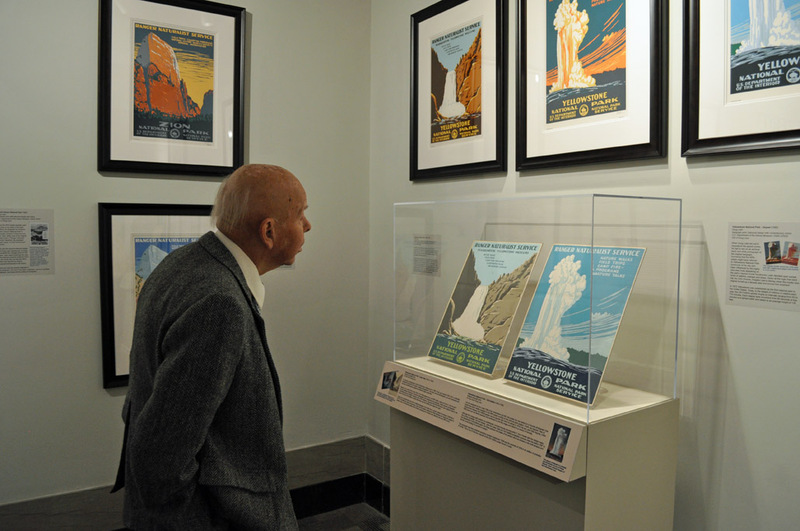 In about 1998, The Parks Company posted on their website (www.theparksco.com) a high resolution photograph and labeled it C. Don Powell, the WPA artist responsible for these designs. I had that photo, but only a poor quality resolution--so I knew they had contacted someone who knew the history and offered up a better photograph. Up until then, the artist(s) were unknown. I called my contacts at the Berkeley Historical Society and the Bancroft Library and no one had heard of C. Don Powell, nor his association with this art. Ten years went by and finally a grad student called me and wanted to do her thesis on this poster project and I shared with her everything I knew. But I informed her that I couldn't prove the artist's identity, but Mike and Joe could as they had posted this photo. This grad student, MM, contacted Mike and learned the identify of C. Don Powell, and his son Richard, still living in rural Eastern Tennessee. I immediately flew out and spent two days interviewing him--as I had just been contacted by the Department of the Interior for a one year exhibition of all my reproductions and contemporary art. I needed more history. What I discovered were the six letters posted here that describe the deception perpetrated on the artist's son, Richard; he was 76 years old and had searched the internet for the first time in his life--to inquire why my reproductions were different colors than two originals his father had given him. However, Richard didn't find me on the web, he found Mike Baggetta, dba The Parks Company. Mike, realizing his good fortune, essentially passed himself off as me and coaxed two original prints, Zion and Yosemite (even sending an empty art shipping case) from Richard to "archive, photograph and document" these poster prints. In most of these letters he promised to follow Richard's wishes: 1.) to give his father the credit he deserved and 2.) to have them donated to the National Park Service. Mike did neither and the posters have never been seen since. This period of time was just prior to the Department of the Interior Museum request to exhibit the entirety of my historic reproductions and contemporary designs--which occurred from April 2014 to May 2015. The news of the artist's identity and the possibility of expanding the exhibit was an exciting discovery, albeit 10 years late. 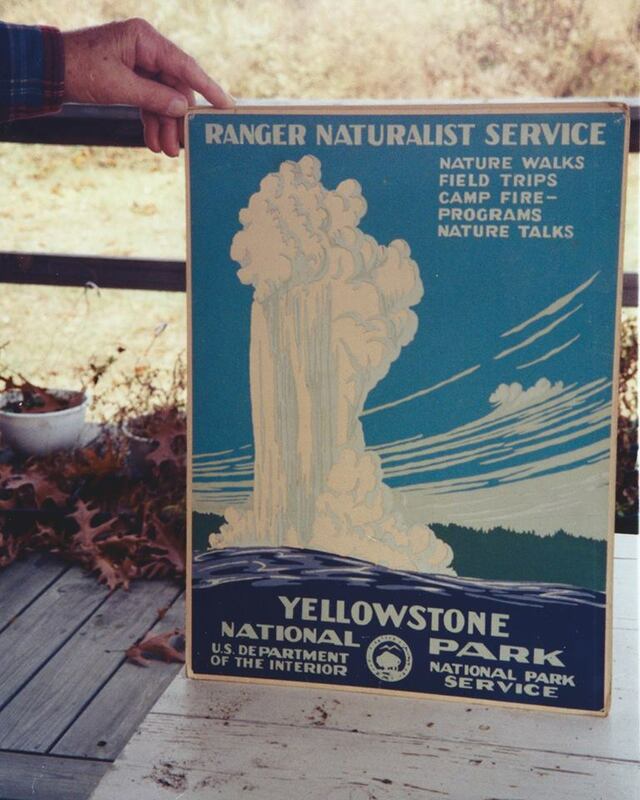 I called the NPS archives and they never had received the Zion and Yellowstone originals.
" Mike/Joe: This is an open letter to both of you and I'm also copying to Perkins Coie Law Firm in Seattle who represents my in copyright issues. I am also copying "MM" who has been a go between (who originally contacted me about the origin of these prints). Finally I'm copying the Director of the DOI Museum. My works now number about 45 designs and they have been selected by the Department of Interior Museum permanent collection and will be on display at an exhibition beginning this Spring. Naturally, I've been doing quite a bit of research about this artwork and through "MM," obtained Richard Powell's contact information. I flew out to Tennessee and met with the family and reviewed many of their items that relate to their father, C. Don Powell. I was looking for anything that would be suitable for this exhibit. They informed me they lent you two original prints--Zion and Yellowstone Geyser, also some family photographs. 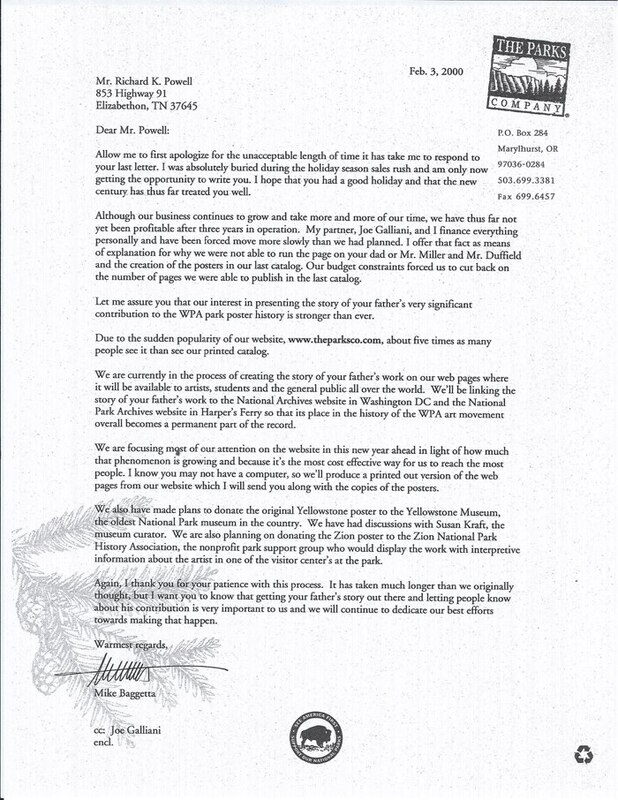 I've read over your letters and checked with both the specific parks and also the Archives at Harper's Ferry. Neither of them have seen these prints. Do you still have them? If so, will you send these to DOI for the exhibit? Thank you." I haven't heard back from you about my proposal that you return your original Zion and Yellowstone prints that you took from Mr. Powell. I've been invited to give a talk April 8th at the Department of Interior Museum luncheon about my preservation efforts and the discoveries associated with Mr. Powell's art. Further, DOI will be filming the complete history of what I've discovered about these prints the day before, both as an archival record and to use in a larger DOI film. 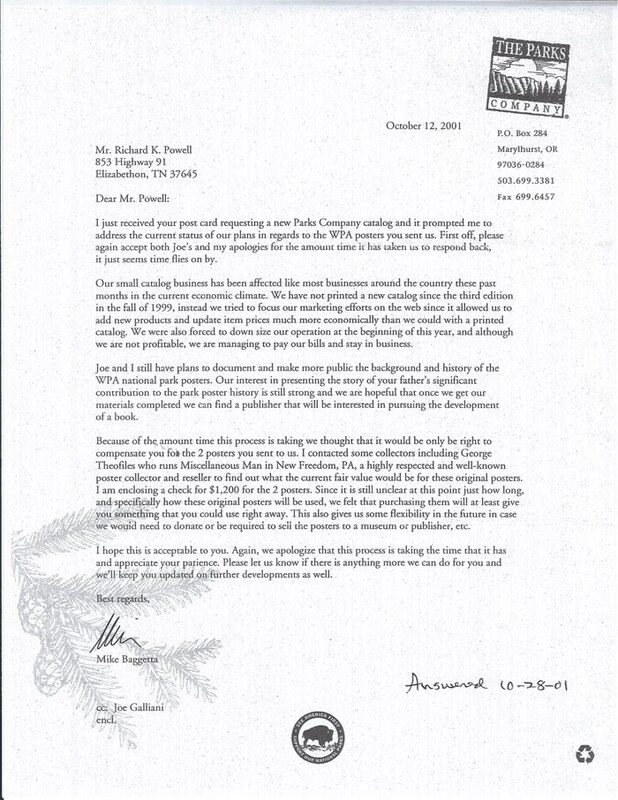 I will of course, provide as public record all my correspondence and research over the years, including the five letters Mr. Powell gave to me. I'm not happy about a couple of things Mike. Forget the fact you tried to sell my domain names back for $5000. I'm unhappy that you passed yourself off as me to Mr. Powell, gained his confidence, and then unilaterally "purchased" two prints for the paltry sum of $600 each. And keeping his family photographs…. And I fully suspect that you sat on this information, ignoring your promise to Mr. Powell to give his father the “credit he deserved,” to cover your theft for 10 years. Meanwhile, Dale Miller passed away in 2005 taking the rest of this 'lost history' with him. This is inexcusable, Mike. But, I'm going to give you a chance to rewrite history. If you donate these as you promised and stated clearly in your letters, I'll simply include you in the filming of what a generous guy you were recovering these two prints and convincing Mr. Powell to donate them to the NPS. And you can quit feeling guilty when you look at these prints each day. You've got precious little time as I'm taping this on April 7th. 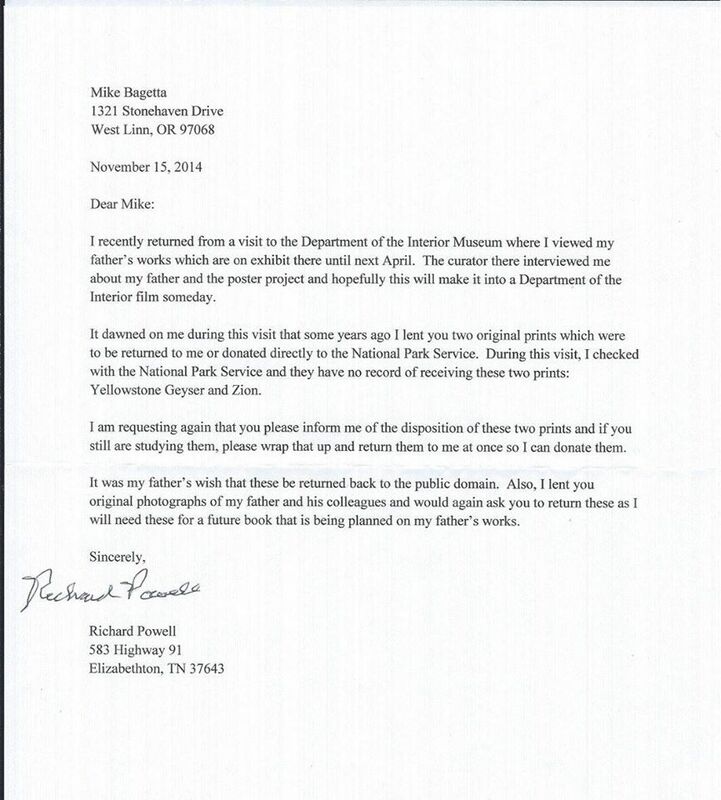 And for the record, the NPS cannot solicit any museum materials by law, but they can accept donations willingly proffered which is why they haven’t contacted you. But I am, and will sue you in behalf of the Citizens of the United States (public domain) to reclaim these prints in behalf of the NPS. SB, my attorney over the past 15 years, who communicated with you about the domain name business, has moved over to Perkins Coie and now will take this recovery Pro Bono; so your next letter will be from her. So Mike, it’s time to fess up or lawyer up. Ranger Doug “Ranger of the Lost Art” "
After the DOIM exhibit closed, I approached the NPS about taking this exhibit on tour for the NPS Centennial but the NPS didn't have the funds......so.....Ranger Doug is doing this privately. I feel this art is public art and should be seen by the public so this next year is the one time to view a collection as large as the Library of Congress (also five originals). These five will be donated back to the NPS at the end of 2016 with two on temporary loan to the Smithsonian. So Mike--where are the two you coaxed from the artist's son? 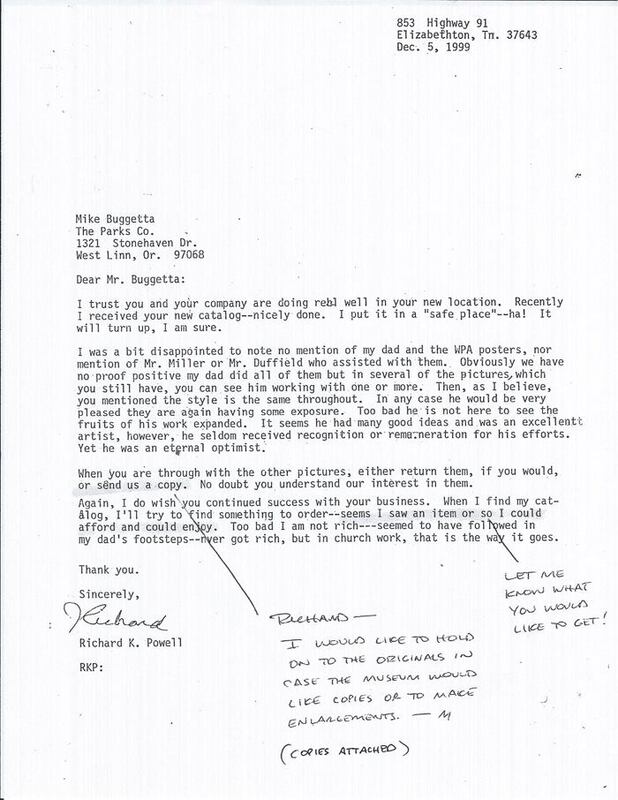 The saddest part of this narrative, as my letter to Mike states, is that Dale Miller, the last WPA screen printer, died in 2005 and took his story with him. If I had known of Richard Powell, I could have learned the whole story. Mike sat on this information to hide his deceits. Mike's letters speak for themselves--that he wanted C. Don Powell to get the credit that was denied him--WPA artists couldn't sign their art. He mentions research & working with the NPS. 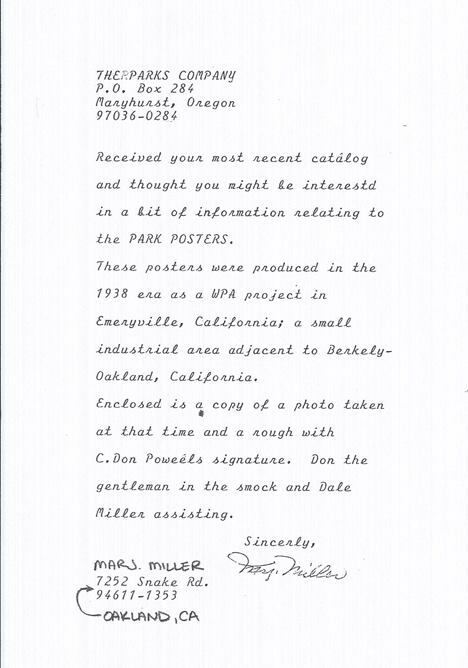 But Mike stalled, obfuscated, and misrepresented himself as having dialog with the NPS for the purpose of donating the Powell prints. (He did donate the 6 Dorothy Waugh prints--and then asked for them back but that's another story.) He claimed he had them appraised by a Pennsylvanian art dealer who specialized in WPA poster art, which did not occur--I checked this out also. But the dealer did appraise a Mt. Rainier for $1800 in 1999, about the same time as these prints were taken. I also checked with the Yellowstone Museum, and the NPS archives at the Harpers Ferry Center did two specific searches--finding nothing. News Update (2018): These two prints get returned: To continue my story, I returned from my 15 month road-trip around the country giving my talks and began preparing a final trip back to Washington to donate my private collection (once numbering 6 prints). I had a brief meeting with Director Jarvis at the Pasadena Convention Center at the beginning of the NPS Centennial and I explained this story to him and that I needed the help of the General Services Administration (GSA) who owns all things WPA. I received a call from GSA a month later and spent a good deal of time explaining everything to their investigator. About three months after that phone conference, they called again and explained that the FBI could not seize these two prints. WPA artwork is still owned by the public and cannot be privatized as the associated news articles posted on this website describe. One exception is posters--simply because they made multiple copies with three being given to the artist for their portfolios, and it was this act that blurred the line between private and public art. Mike had taken these two prints that were ostensibly owned by C. Don Powell and thence his son Richard. The FBI also told me that they couldn't relate any of the investigation except for one piece of information--that Mike had just gotten divorced. I immediately called his wife and asked her if Mike still had these two WPA prints, then tried to backtrack......but the genie was out of the bottle. I then called Mike and asked him where they were and that I didn't believe his earlier correspoindence that he had already returned them to the NPS. He was vague with me and when I reminded him of his shenanigans back in 1998 with the cybersquatting and his $5000 demand for my domains, he hung up on me. I next went to the estate of Richard Powell and informed them that the only remaining option was a civil action. I would pay the attorney and filing fees; they did't want to get involved. My only other recourse was to have them deed these to me and let me go to court without them. 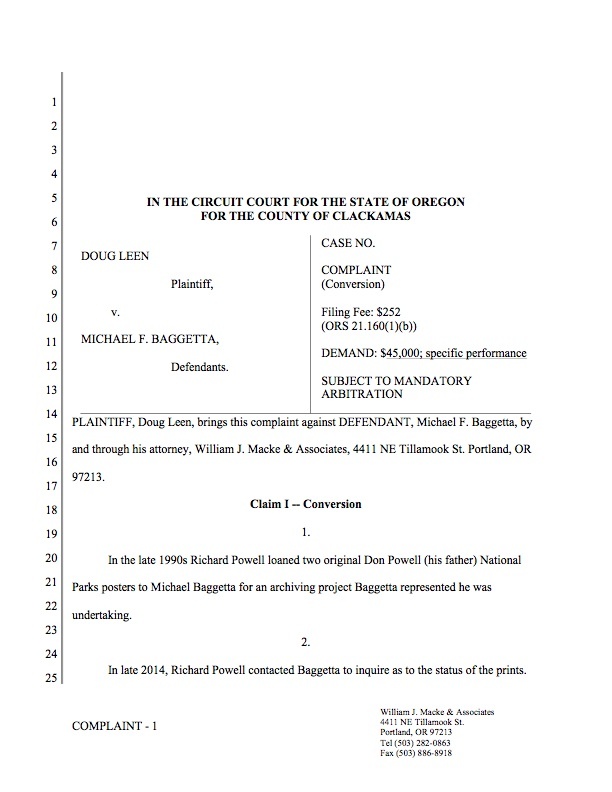 They signed over ownership to me and I immediately launched a civil action to haul Mike into court and let him lie to a judge. He folded his hand at this point and returned the two prints! Finally, after 19 years, they now reside at the Harpers Ferry Center NPS Archives. Ranger Doug always gets his man! Mike--these Zion and Yellowstone originals belong to the public--where are they? These are the two prints--held by Richard Powell. Below is likely the first letter of exchange after a phonecall.. Mike is elated to have learned the whereabouts of two originals and sends two reproductions (screen printed by me) in their stead. The book that was sent was not updated--but Ennis Carter did produce a new edition including the national park series by C. Don Powell. Mike gets no credits here..... Mike did donate six Dorothy Waugh prints (which I pointed Mike towards a year earlier). Mike, in a phone call to Tom Durrant, tried to take these back from the archives. Tom Durrant, called me asking my advice--was for the NPS Archives to keep the Waugh prints. Mike's last large paragraph here is pure bunk. Mike even sends a special art case to protect these rare prints. Below, Marj Miller, wife of Dale (who was elderly and likely couldn't write) writes to Mike some of the history of when and where these were made. 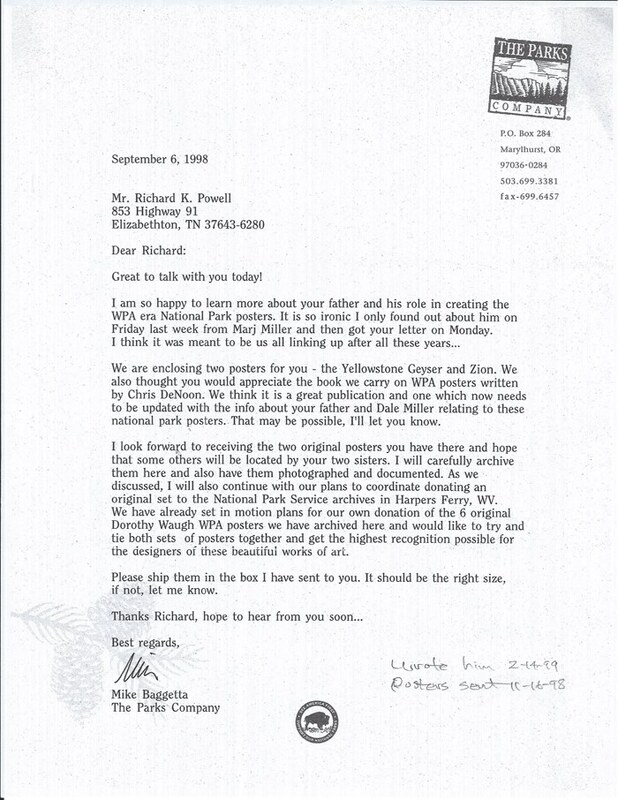 This letter undated but is likely in the Fall of 1998--Dale Miller died 7 years later taking his story with him. This letter (below) is pathetic. Richard still holds out that his father will get the recognition he deserved. Mike holds on to the originals (including the family photographs) in case.......the museum wants copies. Copies, Mike? They want the originals--as you earlier promised. The below letter is nothing but hooey. I refute every paragraph--in fact, Mike did just the opposite. He witheld this information on his website because if this information came out, I would have seen it and sought out Richard Powell and discovered this deception. Mike also switches the potential donations to the Zion Natural History Association and the Museum of the Yellowstone; more obfuscation. I work with both of these organizations and when I called them, neither had received their respective original poster. Neither was Harpers Ferry nor the National Archives linked to this discovery. Quite to the contrary, Mike furthers his deceptions and obfuscations by stalling for time. 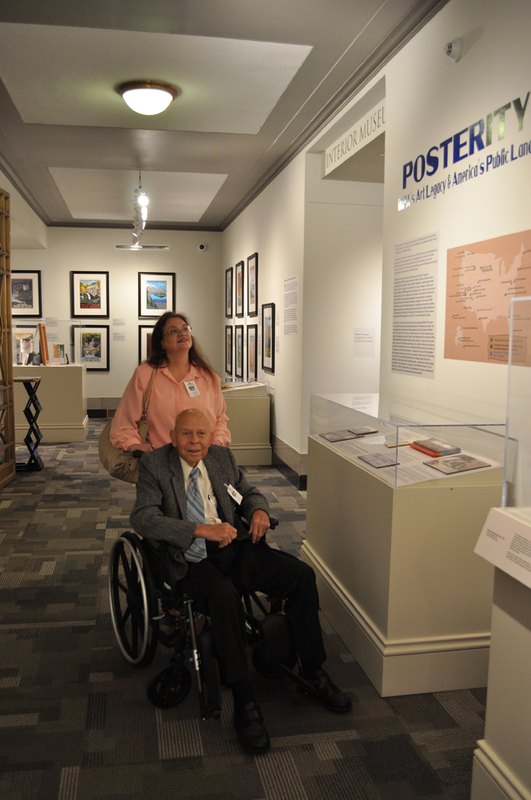 Mike--meet Richard Powell, the man you "bought" two original WPA prints from. 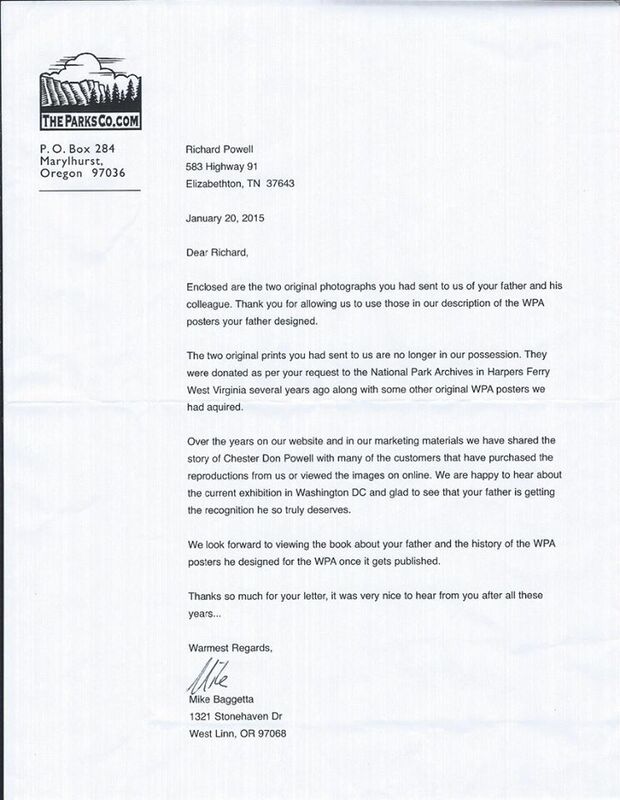 A letter from Richard Powell to Mike Baggetta (below) describing his trip to Washington DC to view his father's exhibit, and asking Mike the final disposition of the two originals he lent to Mike 15 years earlier. I sent both Richard and his wife, Nancy, up to Washington, put them up in the Hilton Hotel for two nights, so Richard could view his father's works and the "credit he so deserved." Mike: This is what Ranger Doug had in mind when it comes to giving C. Don Powell the credit he deserves. 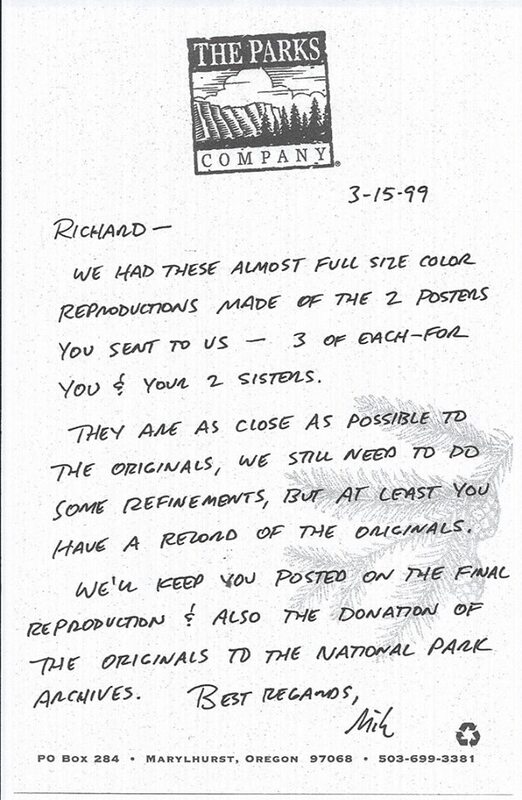 Mike's final letter to Richard (just weeks before Richard's death) stating that he donated the original prints to the Harpers Ferry Center (NPS Archives). But that never happened as Mike continues his deception.......read on. After reading these letters, first made available to me at Richard Powell's home in Tennessee, I instantly figured out Mike's deceptions. Mike had used every trick in the book to convince an elderly man out of very valuable artwork--artwork which was intended to be returned to the public domain; sending him reproductions in place of originals, coming up with a non-existant appraisal, and stalling for time, hoping Richard would pass on before this became an issue. In short, Mike bilked a senior citizen out of his wealth and deprived him of his last wishes. I subsumed Collections at HFC this month and am now division chief for 2 units. Wade has kept me informed about this issue for a long while, so I am somewhat up-to-date on the issue. As Wade mentioned he has not found the posters in our collection. Last year, we did a thorough check, when we moved collections to work on the floor and then moved collections back when the floors were done. If the posters were here, surely they would have been found during those 2 moves, and they were not found. When Mr. Doug Leen brought to our attention the possible donation of NPS WPA-era posters by artist Chester Don Powell, we made a careful and thorough search of our records and collection materials, but we found no evidence that Harpers Ferry Center (HFC) ever received from either Mike Baggetta or The Parks Company original WPA-era Zion National Park or Yellowstone National Park (geyser) posters/prints. As you have pointed out we conducted another thorough check for these posters/prints recently when we moved the collections to work on the floor and then moved collections back when the floors were done. 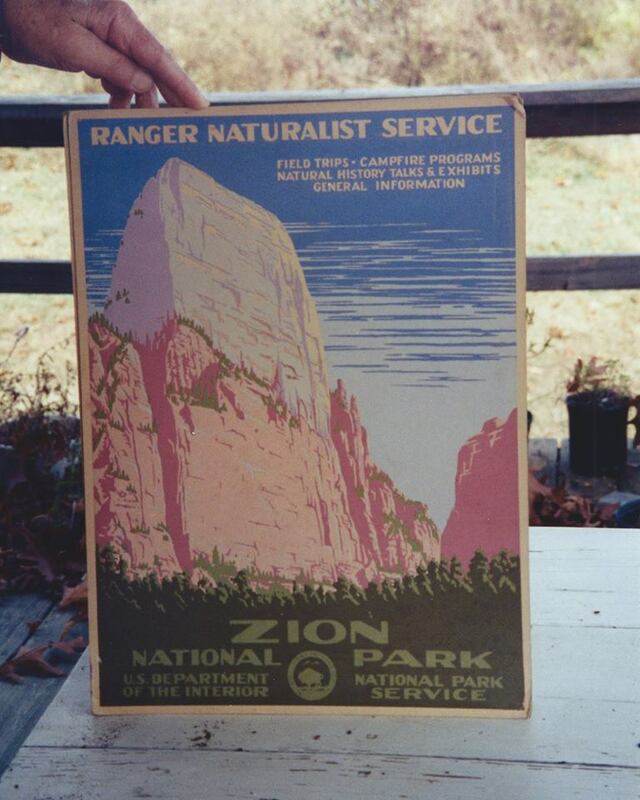 We do have in our collections several reproductions of the Zion National Park posters/prints created by Mr. Leen of Ranger Doug's Enterprises which include a copyright symbol, the date 1995, and his name. 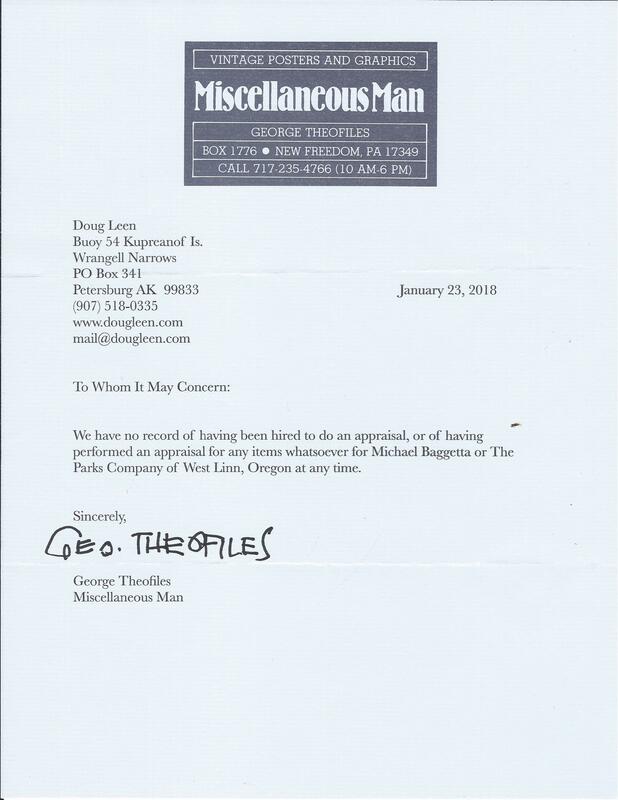 Perhaps Mr. Baggetta can provide a copy of the transmittal letter sent to HFC which would have accompanied the two original posters/prints he claims to have sent here. This matter should not be confused with the donation of six (6) pristine WPA-era color lithograph posters by artist Dorothy Waugh which HFC did receive as a donation from The Parks Company when Tom DuRant was working here (I don't know the specific date). Mike--where is the "Letter of Transmission?" Early January 2018, Mike Baggetta is served a complaint requiring him to respond to the Court as to the whereabouts of these two prints. January 29, I received a phone call from Nancy Russell at the Harpers Ferry Center Archives, who replaced Linda Blaser. Nancy informed me that she has just received two original WPA posters from Mike Baggetta, 19 years after borrowing them. Meanwhile the public was deprived of these for the NPS Centennial, in 2007 Dale Miller passed away taking his side of this story with him, and sadly Richard Powell never saw them returned before his death in 2016. There are still three missing posters: Wind Cave and Great Smoky Mountains which have never turned up. The HFC Archives has a set of black & white negatives taken in about 1950 of these two images so we know what they look like. The only known copy of Yosemite was auctioned in 2005 for $4320 to a private buyer; both the Library of Congress and I had expended our budgets. If any of these three surface I will purchase these for $5000 each with the promise to donate them to the National Park Service or Interior Department depending on their collection needs.